what are the effects of organism size and species diversity on whole community respiration rates? Ecosystem functioning is all of the biotic and abiotic exchanges of matter and energy within and between ecosystems as well as the environment. It is a vast field or research involving biogeochemical cycles, primary production, gas exchange and much more. Whole community respiration, or the production and consumption of carbon dioxide (CO2), is one variable of ecosystem functioning. Ecologists debate whether biodiversity or the traits of the dominant species affect ecosystem functioning. There is a positive relationship between biodiversity and ecosystem functioning as an increase in the number of species leads to more niches being filled in an ecosystem and, consequently, a more efficient exchange of energy and matter. On the other hand, if one or a few species dominate an ecosystem then the traits of these species will be correlated with the level of ecosystem functioning. Long and Morin (2005) aimed to test these hypotheses in an experiment on micro-organism food webs. Their experiment involved different experimental food webs of bacteria, algae and protists. The bacteria and algae acted as basel resources for the higher trophic level organisms of protists. A number of different protist species were included and covered the functional groups of herbivores, bacterivores and omnivores. 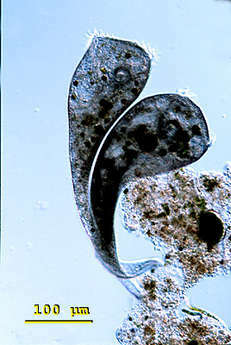 The experimental treatments consisted of large or small sized protists within species rich or species poor assemblages. Ecosystem functioning was measured as the total amount of carbon dioxide production, or respiration, of the community. 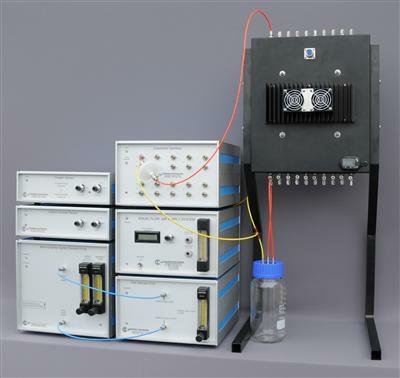 CO2 production was measured with a Columbus Instrument Micro-Oxymax Respirometer. The Micro-Oxymax Respirometer is a closed-circuit respirometer that samples the air in the head space of a sample through the instrument and then back to the sample. In this manner there was little disturbance to the experimental microcosms. The Micro-Oxymax could accommodate up to 10 microcosms simultaneously and all microcosms were measured on a weekly basis over a period of 6 weeks. Respiration was measured as the total amount of CO2 accumulated over a 7 hour period. The researchers found that after 6 weeks of the experiment, the microcosms in the different treatments had converged on the same total biomass even though there were persistent differences in organisms size within each community. They also observed that total community biomass increased over the first 2 weeks of the experiment but there was no change from week 3. Total community respiration declined from a value around 2,000 to 3,000 μl CO2 per 7 hour period in the first week of measurements down to a value of around 500 to 1,000 μl CO2 per 7 hour period by the sixth week of measurements. The microcosms with the highest species richness had the lowest amount of respiration. Furthermore, CO2 production was not influenced by one or two dominant species but was controlled by aggregate features of the entire microcosm. Figure 4, from Long and Morin (2005), shows these results. The authors concluded that community respiration did not depend on organism size and was not influenced by dominant species. Community species composition can influence respiration and that an increase in species richness caused a reduction in community respiration. Long and Morin, 2005. Effects of organism size and community composition on ecosystem functioning. Ecology Letters, 8, 1271-1282.